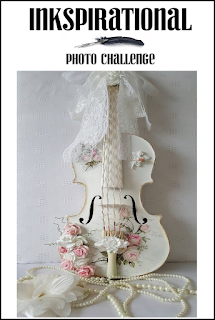 I've taken the violin as my main inspiration, and also gone with the lace and pearls, roses and overall romantic feel of the image. The violin is a very old unmounted stamp from my stash - it must be around 20 years old and I think was originally from a grab bag bought from the American company Raindrops on Roses (I don't know whether they are still around). After stamping and cutting out, I covered it with Glossy Accents. The stamped music background uses a Kanban stamp and the embossed one a Darice folder. I've added ribbon, lace, pearls, resin roses and die cut leaves to make a card oozing with springtime romance. A beautiful card Jane, lovely colours and lots of super layers. Beautiful colors, Jane! Love that violin and the distressed edges. Perfectly shabby chic!